Posted By Carlos On March 29th 2017. Under Annotated Bibliography Tips Tags: bibliography type, enumerative bibliography, enumerative bibliography example, example of enumerative bibliography . There are many types of bibliography that you are likely to come across as you read different literary works. A bibliography is basically a detailed listing of sources that you have used as a reference in the process of researching your own work. Most of you, therefore, must have handled an enumerative bibliography before but thought of it as just bibliography. The meaning can be interpreted quite literally from the words that make up the term. An enumerative bibliography for books can be described as a list of literary works that are based on a particular subject matter or field of study. An enumerative bibliography is the most common bibliography type in research writing and it basically the list of sources that most authors put at the end of a piece of writing so that any reader can be able to know where cited information was sourced from. Most of the bibliographies most people handle are enumerative bibliographies. The bibliographies range from “works cited” lists which appear at the end of books and articles to complete and independent publications. Note down the full title, author, place of publication, publisher as well as the date of publication for each source. This applies for an entry of a book in a bibliography. For an entry of a journal or periodical article, elements contained in the bibliography include the creator, article title, journal title, volume, pages as well as date of publication. There are a set of common abbreviations that are used in place of full names in the documentation of bibliographies. Make sure you list the sources cited in alphabetical order using the author’s last name. In the case where the source has more than one author, alphabetize using the first one. Page numbers should be included to indicate where the citation is extracted from exactly. This is particularly significant where your sources are part of multi-source volumes. For a case where no date is given you should indicate (n.d.). Publication titles must either be italicized or underlined or both. You could also indicate the names and locations of the companies that published your copies of the sources though this is not mandatory. APSA citation style requirements and advice are here! Our experts have dealt with all types of bibliographies in detail and they will provide you with relevant advice on how to go about writing an enumerative bibliography. The first step of writing a perfect bibliography is knowing what exactly it is and what it constitutes. This particular bibliography type is based on a unifying principle such as a creator, subject, date, topic or another characteristic. 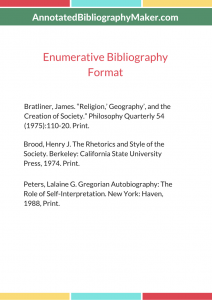 An entry in an enumerative bibliography provides the core elements of a text resource including a title, creator, publication date, and place of publication. Our writers who have worked over the years have come up with complementary examples that constitute every element that should be present in a complete bibliography. Our enumerative bibliography is therefore wholesome and it includes all the aspects that you will need to know. Example of enumerative bibliography is very straight in its wording and everything is quite clear and everything could be explained to you if you have any question. 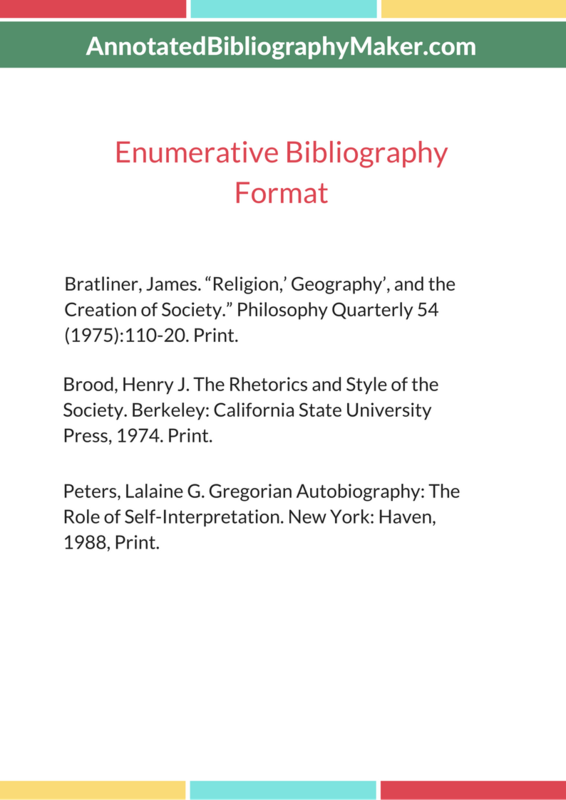 The enumerative bibliography sample guides you fully on how to write a bibliography on your own. You can reach our team and they could assist you come up with one. We are quite fast and efficient and it only takes a few seconds to get back to you when you reach us for assistance. For the best enumerative bibliography example, you can reach us and you will not be disappointed!